« Panels » are a combination of a LCD screen, and some sort of input method ( encoder wheel, or buttons ). They are used to control your machine without having to use a host computer and a USB or Ethernet connection. To use a Panel, you need to wire it to your Smoothieboard, and to set it up in your configuration file. This page describes the wiring and configuration for the currently supported panel types. Menu entries can be added from the config file for simple commands, for instance the following adds a Power on and Power off menu entry. Note that _ will be converted to a space when displayed in the Menu. Commands can be seperated with a |. If you want to add a menu entry that probes your z-axis you will have to use a command like G30 Z0 followed by a G0 Z10. For this you need a custom menu entry “custom_menu.zprobe.command G30Z0|G0Z10”. This moves the z-axis down untill it hits the probe, sets Z to 0 and moves 10 back up. WARNING using the external sdcard for printing from is not recommended, and is NOT supported. Running SPI over long (or even short) cables is problematic, and can cause random hangs and/or corrupted data. I am not aware of a way to fix this other than using differential buffer drivers. For the RRD GLCD it CANNOT share the same SPI as the LCD so it must be hooked up to the onboard sdcard SPI and use a spare pin for the sdcs. Also note that an external SDcard sharing the SPI port with the onboard/internal sdcard must be ejected before rebooting as the bootloader does not like the external card. NOTE Smoothie will not boot if the external sdcard is inserted in the RRD LCD sdcard slot at boot time, it must be inserted after it has booted. Panel.back_button_pin should be commented out. 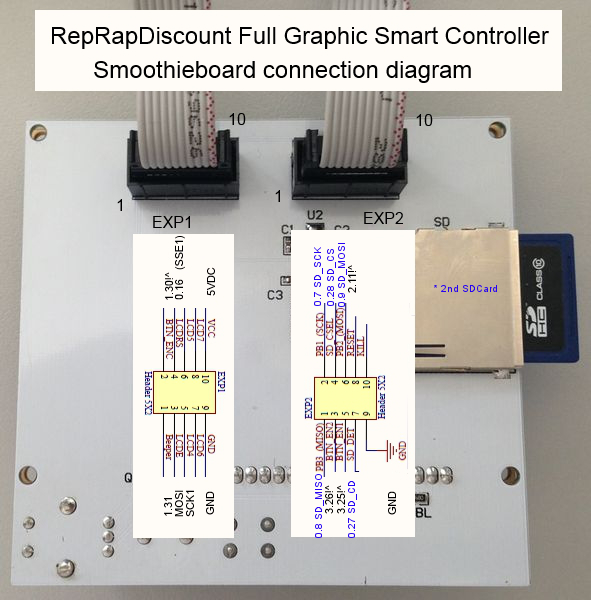 The Reprapdiscount GLCD is a black and white graphical display with an encoder control button that allows you to control your Smoothieboard. It is one of the most popular options for panel controllers. Power from the 5v line directly, from the 5v uart pin with a decoupling capacitor of at least 0.1uF, from a + pin on an unused endstop, or an external 5V power supply capable of delivering at least 500 mA. If you are using the onboard 5V regulator to step down from 12/24V, check the current draw required for your panel - depending on the color/backlight on your GLCD, it may require >250 mA for the backlight. The normal recommended 5V regulator will not supply enough current for those panels - if the panel powers up, it will have very low contrast. 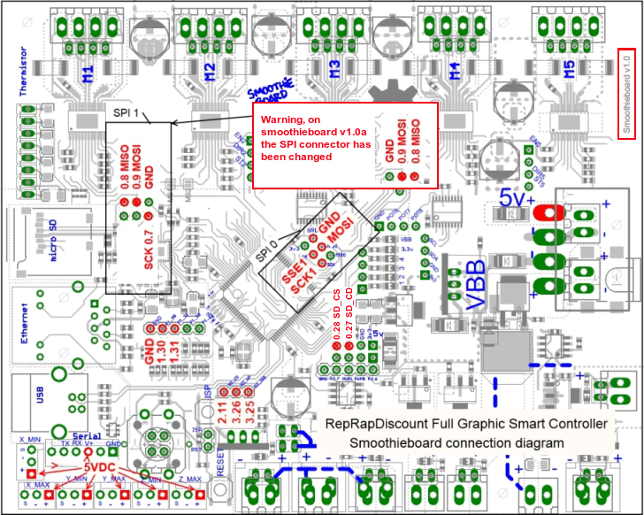 Use Recom part R+78E5.0+1.0 instead - it will supply 1 amp (vs 0.5 amps for the normally recommended regulator). It is available at Digikey, and likely at other major electronics component sites. There is an adapter board to easily connect a ReprapDiscount GLCD to a Smoothieboard with flat cable, howver note this is entirely optional. You can find information about it at the RRDGLCDAdapter page. It's sources are available on github. Note that you may have to solder physical pins to the board for pins 3.25 and 3.26, otherwise the rotary encoder will not work. Note that there are a lot of clones of the official RRDÂ GLCD, and their connectors are reversed. If you buy one of them, you need to modify your adapter board, by removing the sockets of the 10-pin connectors and rotating them 180 degrees each. On the back of the GLCD EXP1 is to left and EXP2 is to right, pin 1 is bottom left, pin 2 is top left etc. You can find a list of pins on the Smoothieboard to connect to the panel here and here. 5vdc availability presumes a 5vdc source (power from SBUS, 5V input, or optionally installed 5v converter VBB). Be aware that RRD does not follow proper conventions for pin numbering. 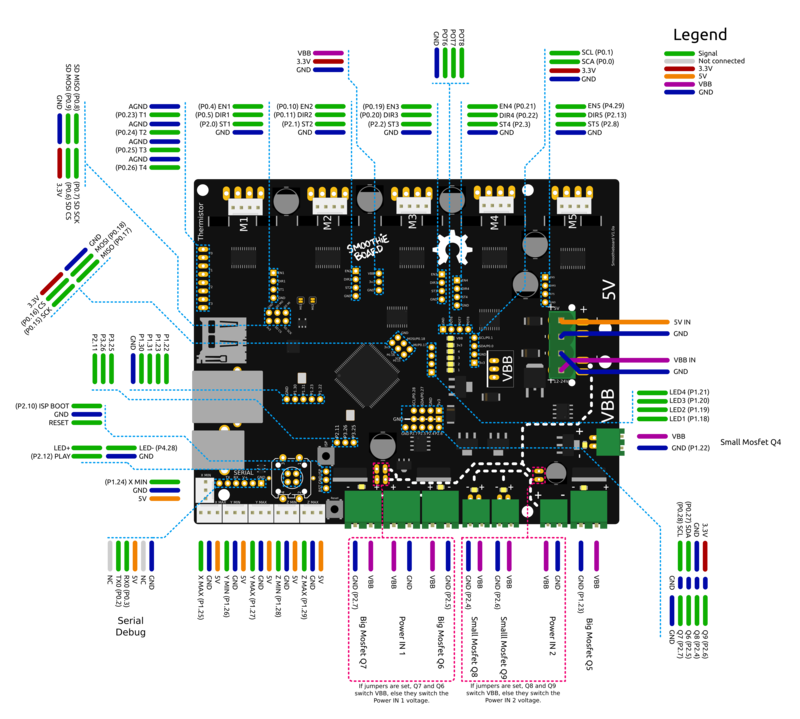 The pin 1 indicator on the ribbon is actually pin 10 in the RRD schematic. The image above is numbered according to the RRD inset schematics. This interface board is simple to install, eliminates custom cables, frustration, and wire mess. It is compatible with Azteeg X5 Mini v1.1 motion controller and is available from www.UltiBots.com. Source files are on our GitHub. This wiring harness uses three 2×10, one 1×2 .100“ crimp housings and one heat shrinked female pin to connect the RRD GLCD to an Azteeg X5 Mini. Note: This information is compatible with Azteeg X5 Mini v1.0 motion controllers. Works with the Reprapdiscount GLCD driver and is available for around 7â¬ or 10$. Just wire the display unit as indicated. 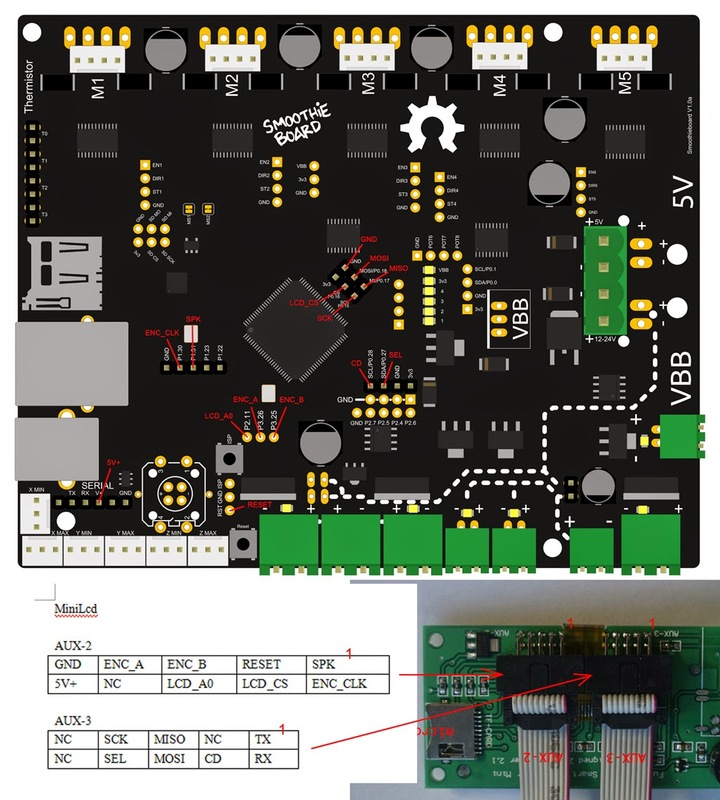 The AZSMZ 12860 panel is a full graphic controller that you can wire to your Smoothieboard. See the wiring diagram here. panel.lcd                        viki2               # set type of panel. AZSMZ 12864 LCD is similar viki2, also set to viki2.